Associate professor of art Chris Jordan received the juror’s award for his image, Emptying, in the upcoming exhibition Myths, Legends and Dreams at the Vermont Photoplace Gallery in Middlebury, Vt. The exhibition dates are March 7 – March 31, 2018. The juror, Amy Holmes George, is executive director of the Texas Photographic Society and a fine art photographer based near Dallas, Texas. She has held teaching appointments at Collin College, Baylor University, University of North Texas and Stephen F. Austin State University, and exhibited widely throughout the United States and Italy, England, France and China. Her work has been featured in over 100 exhibitions and is housed in several permanent collections, including The Getty, The Kinsey Institute and the Fratelli Alinari Museum. In Chris Jordan’s landscape photography, he creates imagery of both real and imaginary places. He specializes in both analog and digital processes, finding resonance in how creativity unfolds through technology. Jordan has exhibited throughout the Northeast and his work is held in numerous private collections. 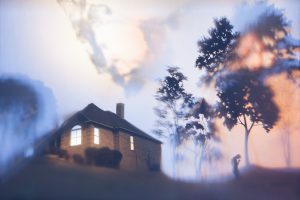 View Jordan’s work and the other images in the exhibition here: https://photoplacegallery.com/myths-legends-dreams/.